This picture was taken last February. A leaf tissue test was sent off and then the area immediately sprayed with manganese. The spray made no difference and the leaf tissue test came back low in manganese and magnesium. After advice from Plumbo, I gave it a dose of phosphite, manganese & magnesium. There was an almost immediate response, but a second dose was needed later on. What ever the problem, I think a bit of phosphite in the mix can give the plant a useful kick. 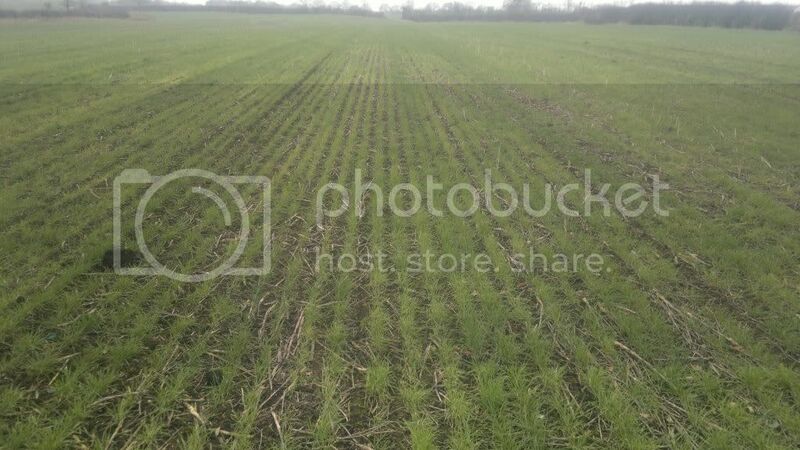 The field was wheat, direct drilled into OSR stubble, on light land. If you look carefully, the drill tractor wheelings can be seen, and also the combine wheelings running at a diagonal to the drilling. The black lump in the picture is top dressed compost! Hi, this is my first post so here goes.. it looks as though you have similar problems to us in previous years, on dark sandy ground, one field inparticular, it lacks manganese, but the problem is made many times worse by lack of consolidation! i.e the wheeling from the drill and roller tractors grew ok yet the rest needed several passes with manganese. No way, not in isolation. Possibly several factors (herbicide damage, sulphur deficiency and Mn deficiency) all exacerbating each other. As already said the problem is in fields sprayed with Atlantis,Mn is a big problem on this land and is applied as part of our spray routine. Sulphur is the only common factor on soil and tissue samples off any poor area's although P is short on one and K & B on another. Any help or idea's will be apprecciated as we really do need to find the problem. Thats exactly how this started off aapplied the same.only ours carried on going back. Ever try Manganese Sulphate powder? (31% mn + Sulphur). We have some reasonably sandy land with high pH (nearly 8!) which always suffers from Mn deficiency. I have tried liquid Mn in the past with very little if any effect. However, I find the MnS terrific. +1 on lack of consolidation, this will always make trace element deficiencies worse. We have some WW which is showing up with Mn deficiency in the usual patches. I plan to spray it next week with MnS once ground conditions allow (no snow here, +10deg C). I'll take some pics tomorrow. MnS is also incredibly cheap but has some mixing restrictions. I am sure that the S in the product is also helping. looks like chronic manganese deficiency to me ? We have a field with patches this year, not so bad but not looking as good as they should, our agronomist thinks we have had some damage from Avadex application ?? Phosphite will not do it. It has to be a phosphite/phosphate product with adequate Mn Mg and in this case sulphate. Disgruntled neighbour rounduped for you in the dark? The photo posted by Mr Bean is exactly the problem that we have seen and sometimes it just gets worse despite Mn + Mg spray. Lack of any of these will give symptoms shown on sandy soils. But we never see this problem in oats or rye or OSR for that matter - just in wheat and barley (which don't have manganese fixing bacteria round their roots). I am not sure that spraying on manganese sulphate contributes enough sulphate to do any good. What surprises me is how agronomists generally don't seem to have an answer to the problem. What we used to do as a rescue measure was give it a bag to the acre of ammonium sulphate and maybe half a bag of ammonium nitrate. We also added some nitrate to the sprayer tank when we sprayed it with manganese and magnesium. So in the sprayer tank 5 kg/ha MnSO4, 5 Kg/ha Mg, 6 Kg/ha Ammomium Nitrate. It looked terrible, and the odd small patch was completely bald but it still did 3 ton. Could not roll it till it had recovered because feared burying the plants. Never considered phosphite. Don't know anything about it. We always had high phospate on the sand. mn PK ok wondering if atlantis has anything to do with it. Looks like to cut losses and redrill with spring wheat but I don't want to through good money after bad. hi skimmer hate changing thread subject , but is it a philip watkins tri till and if so how do you rate it ? I only had it for a couple of days on demo but it seemed to do a good job. 2.4 metre behind a NH 6050, took it ok with legs down to 16" but would certainly want a bigger tractor if I was buying one. I opted for a new plough in the end. Latest more in depth soil tests have come back showing a Cation exchange capacity of 4.9,and a high magnesium level possibly locking up the potash causing the plants to take in salt. Finally found the problem, Root knot nematode.How deal with it is now the problem. Could it be nematodes feeding on the roots? With the drier milder winter they could still be active but plant roots not regenerating quick enough to feed the crop. Just looked back and you were spot on. I have a couple of fields where it has reared its head this year, it seems very wide spread in one of the fields suggesting it has been there for years unnoticed. I have done quite a bit of investigation into the little blighters, rotation seems to be the most common answer. However from what I can work out, it seems to affect, cereals, legumes, rye grass and beet, so that leaves a pretty limited rotation. My plan is to carry on with my rotation as planned in the hope that it has only reared it's head due to the exceptionally dry back end. One of the fields is due to go into beet, I'm thinking about putting a nematacide to see if that does anything. We had a lot of it in this region a few years ago. It occured when we had a very very warm spring. It seemed to especially effect spring wheat. Potassium silicate comes to mind, probably expensive. Have you tried mapping your crops with specialist drones to provide an in-depth review of their health? Perhaps this could give some insight into what’s working and what isn’t?